What's your attitude towards life in Dresden? Finding new friends and visiting with them new places and relaxing, sitting in modern cafes, bars, and restaurants with modern decorations to get in a good mood. 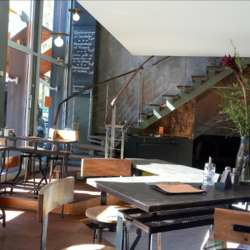 So come with us to Café Eckstein in the center of Neustadt. Enjoy the European food and our own section in the bar exclusive for InterNations Members☺ Enjoy the animated environment outside while you're sitting inside, courtesy of the full glass facade.